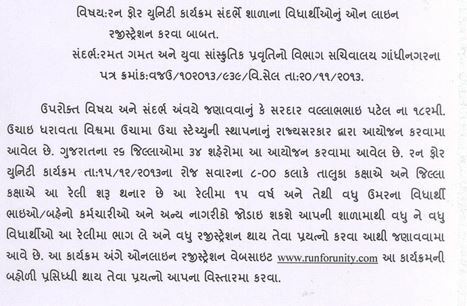 Run For Unity Program Sandrbhe High School Tatha Collage Na Student Nu Online Registration Karva Babat Paripatra Karvama Aavyo Chhe. Gujarat Na 26 Jillaoma 34 City Ma Aa Program Nu Aayojan Karvama Aavel Chhe. yes to thenk for unity. JAY JAVAN ,JAY KISHAN ,JAY BHARAT……………………………..
may like to you dode gujarat. vote for Nareandra modi becuase he is jaan of hindustan. my college toword thanks for “run for unity”. i m coming to join this marathon from Mumbai …………. jay hooo.. I am looking forward to the run for unity. I would like to congratulate Modiji for such an unique idea of uniting the country. the iron man of india is great. you aur my ideal parson Modiji. maine to regitrastion kar diya bhai. Indeed it’s a great event in Indian history. Jai Hind. yes to thenk for unity………. nice aportunity for suporting of narendra modi …………..
sardar vallabh bhai patel na run for unity mate nareder modi ne lakh lahk vandan bharat mata ki jai. ahbhar. Ram abtar me bharat me janme hain. its good job to opening d new page for making d comity jai modi and sardar ji….